This week has been a lot. With work and school in full swing there’s nothing I want to do more than cozy up on my couch after a long day. That being said, the last thing I want to have to worry about is what I’m going to make for dinner. Since DC is finally getting some fall weather, what better way to celebrate autumn than by making a big batch of soup to get me through the week. 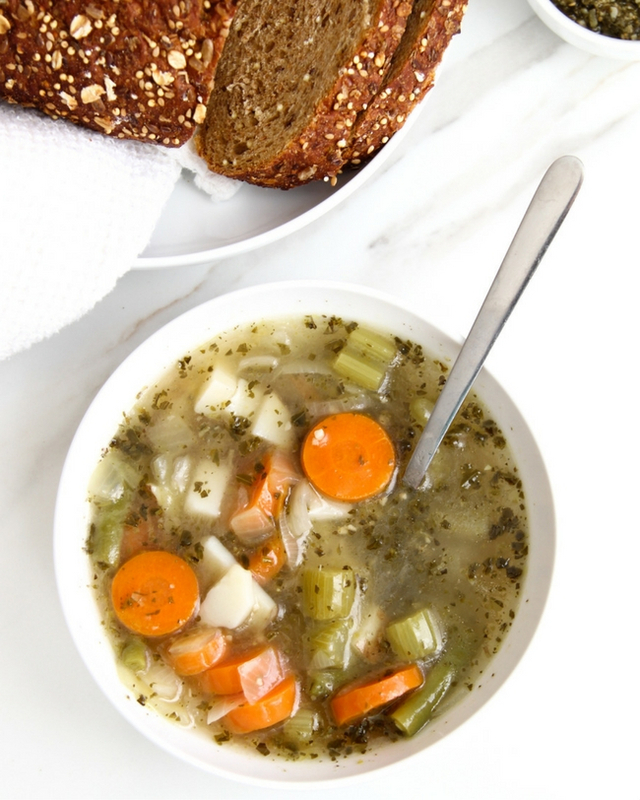 I don’t know about you, but lately I’ve been hearing a lot of people singing the praise of bone broth. So, when I spotted Bonafide Provisions Bone Broth in the freezer section of Whole Foods last Friday, I obviously decided to splurge. Not exactly what I was looking for but I got curious. It turns out that bone broth (being the nutrient dense badass that it is) has a sh!t ton of collagen in it. Collagen, for those who don’t know, is responsible for keeping elasticity in your skin and therefore, aids with minimizing wrinkles in the skin. While Botox can help with wrinkles by targeting small muscles in the face, consuming products with collagen is the best way to bring elasticity back to skin. There are plenty of eye creams and pills out there with collagen, but there’s no better way to absorb all its nutrients than by sipping on a lil bone broth. After my little botox-collagen diversion, I finally found the answer I was looking for. Bone broth is far more nutrient dense than broth or stock because of the way it’s prepared (aka cooking bones) If you're interested in learning more, I found this article to be a great resource. If you’re a vegetarian and you’re still reading this far… kudos to you. The good news is that this simple veggie-packed soup can easily be made vegetarian by using vegetable broth. 1. Place one tablespoon of extra virgin olive oil in a large soup pot and cook on low heat for 10 minutes or so until the onions have turned translucent. 2. Chop the cucumber, potatoes and carrots and add to the pot once onions have been cooked through. Cook veggies on low heat for 5 minutes. 3. Add the liquid broth to the pot as well as three cups of filter water. If cooking with regular broth see note below. 4. Bring the broth to a boil and then simmer uncovered for 30 minutes. 5. After 30 minutes, add the chopped green beans to the broth and 1/4 cup pesto and cook for an additional 10 minutes. 6. Depending on the saltiness of your broth, feel free to add an additional teaspoon or more of salt to ensure that the soup has plenty of flavor. 7. Allow the soup to cool for a few minutes before serving. Note: If using regular broth (chicken or vegetable) use 3 quarts of broth and omit water.